VANCOUVER, B.C. – March 2, 2011 – Demand for detached homes continues to be strong across Greater Vancouver, with particularly high sales volumes occurring in Richmond and Vancouver Westside. For the past two months, the number of properties listed for sale and those sold on the Multiple Listing Service® (MLS®) in Greater Vancouver outpaced the 10-year average in both categories. From a historical perspective, February’s 3,097 homes sales outpace the 2,742 home-sale average recorded in the region over the last ten years. Between November 2010 and February 2011, the MLSLink® Housing Price Index (HPI) benchmark price of a detached home in Richmond increased $190,739 to $1,099,679; in Vancouver West, detached home prices increased $222,185 to $1,850,072. In comparison, detached home prices across the region increased $51,762 between November 2010 and February 2011 to $848,645. “To effectively analyse real estate statistics for the purpose of buying or selling a home, it’s critical to focus on your neighbourhood of choice because, like we see today, conditions and prices can fluctuate significantly within the same city or municipality,” Moldowan said. Looking across the region, the REBGV reports that residential property sales of detached, attached and apartment proper-ties in Greater Vancouver reached 3,097 on the MLS® in February 2011. This represents a 70.3 per cent increase compared to the 1,819 sales recorded in January 2011, an increase of 25.2 per cent compared to the 2,473 sales in February 2010 and a 109.3 per cent increase from the 1,480 home sales in February 2009. New listings for detached, attached and apartment properties in Greater Vancouver totalled 5,693 in February 2011. This represents a 23.6 per cent increase compared to February 2010 when 4,606 properties were listed, and an 18.6 per cent in-crease compared to January 2011 when 4,801 homes were added to the MLS® in Greater Vancouver. “With a sizeable increase in the number of properties coming onto the market for sale, there’s a good selection out there for buyers to choose from,” Moldowan said. At, 11,925, the total number of residential property listings on the MLS® increased 14.2 per cent in February compared to last month and increased 5 per cent from this time last year. Sales of detached properties on the MLS® in February 2011 reached 1,402, an increase of 42.6 per cent from the 983 de-tached sales recorded in February 2010, and a 138.9 per cent increase from the 587 units sold in February 2009. The bench-mark price for detached properties increased 6 per cent from February 2010 to $848,645. Sales of apartment properties reached 1,206 in February 2011, a 12.3 per cent increase compared to the 1,074 sales in Feb-ruary 2010, and an increase of 85.5 per cent compared to the 650 sales in February 2009. The benchmark price of an apart-ment property increased 2.2 per cent from February 2010 to $399,397. Attached property sales in February 2011 totalled 489, a 17.5 per cent increase compared to the 416 sales in February 2010, and a 101.2 per cent increase from the 243 attached properties sold in February 2009. 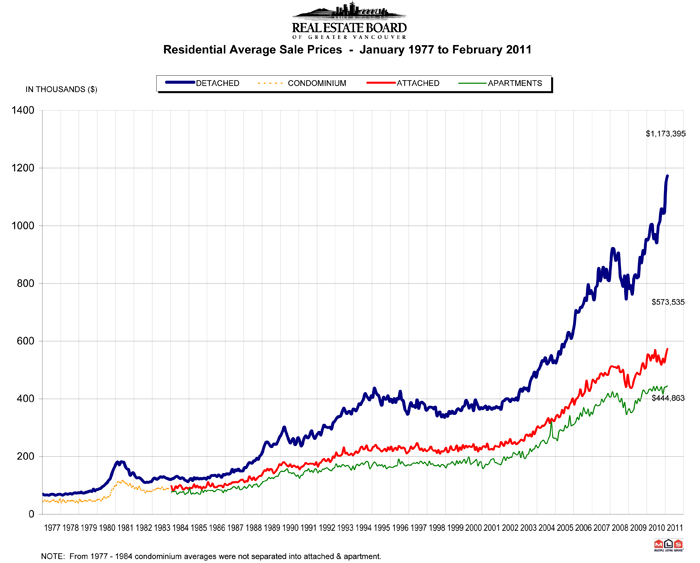 The benchmark price of an attached unit increased 2.3 per cent between February 2010 and 2011 to $507,118.